Show others that you still "Believe" in the possibility of a cure for breast cancer with your own Custom Printed Believe Sweatshirt. Wearing this is a great way to spread awareness for finding a cure while attending a Breast Cancer Walk or simply living your day to day life. 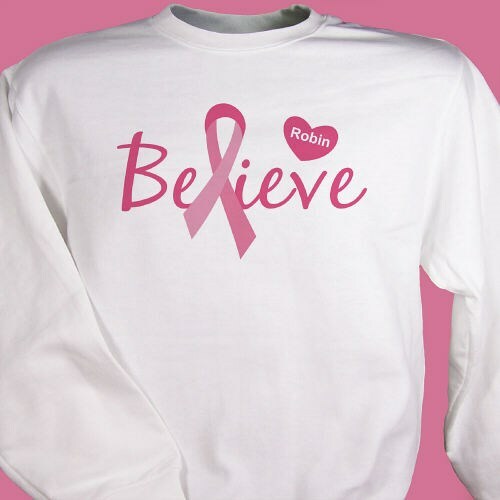 Our Believe Breast Cancer Awareness Sweatshirt is available on our premium white cotton/poly blend Sweatshirt, machine washable in adult sizes S-3XL. Also available on Pink. Includes FREE Personalization! Personalize your Breast Cancer Awareness Sweatshirt with any name. COMFORTABLE AND A LOT OF COMPLIMENTS. Additional Info MyWalkGear.com is the leader in Personalized Breast Cancer Awareness Shirts, Gifts and Keepsakes. We have Personalized Breast Cancer Awareness Gifts which look great. You'll definitely show the world how much you care about finding a cure for breast cancer when you wear this Believe sweatshirt around town. Never give up hope! Our Breast Cancer Awareness Car Magnet is a great item for spreading awareness on the go.